Fish Pose is a graceful, but powerful back bend. The gentle bend of the chest mimics the rounded back of a fish. Fish Pose can give relief to symptoms of asthma and bronchitis. Young children or children with special needs may find fish pose challenging to get into, but it can be easily modified by having them lay on a small child bolster, rolled up mat, or blanket to provide the same benefits. The opening of the chest, opens the heart releasing feelings of positivity and well-being. Fish pose reduces chest disorders and promotes a healthy heart. 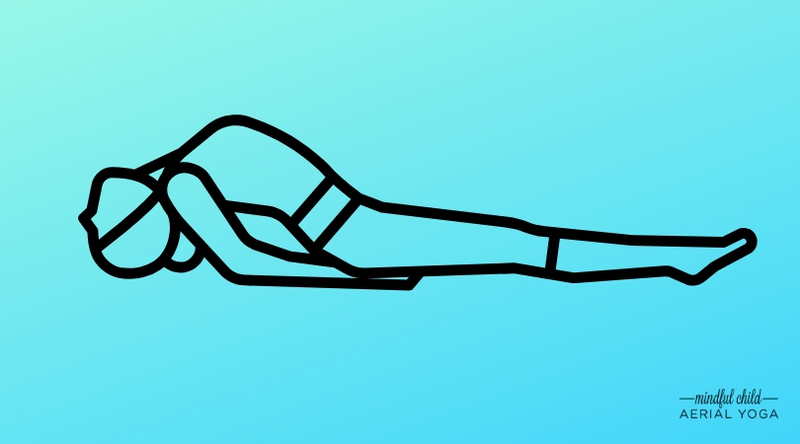 This pose can stimulate the thyroid, which increases metabolism. We are going to be a fish! Lay on your back. Bring your knees into your heart center. Straighten your legs and glue them together. Slide your hands under your tail. Bring them close together with palms facing down. As you breathe in, push your elbows down. Point toes. Come onto the crown of your head. You are a fish! Take five deep breaths. Slowly release to the floor. Hug your hands around the knees or under the knees, bring them into the heart center. Rock and roll a few times side to side. Ah…feels good! Want to learn more ways to help children be mindful? Sign up for Mindful Child Teacher Training or buy my book, Mindfulness for Children.